The contract for freezing the preliminary design of the multi-role transport aircraft project is expected to be signed this week. Russia and India are going to sign a contract this week for freezing the preliminary design of the US$ 600 million multi-role transport aircraft (MTA) project, the Hindu said on Wednesday. The new development will give the project a much-needed shot in the arm, according to the paper. India Defence Minister A.K. Antony had expressed concerns in the past over delays in the MTA project - implementation, the paper added. The report cited sources as saying that further delays in the implementation were likely to be advantageous for rival aircraft makers such as Embraer which is developing a similar aircraft called KC 390 and is expected to be ready in 2014. India’s Hindustan Aeronautics Ltd and Russia’s United Aircraft Corporation hold an equal stake in the joint venture. 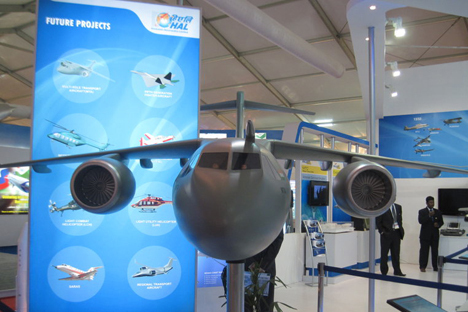 The companies signed a contract in May to develop and produce 205 multi-role transport aircraft, according to the Hindu. These aircraft will be used for emergency and rescue operations and cargo, the paper said. The new contract is follow up of the agreement signed between the governments of India and Russia in September 2010. N.C. Agarwal, Chief Executive Officer of the joint venture company, Multi-role Transport Aircraft Ltd, told the Hindu Business Line that this new development was a definite step forward towards completion of the project. The Russian Air Force expects to place orders for 100 of these aircraft while the Indian Air Force is likely to take 45 of them, the Hindu said, adding that the rest would be purchased by a third party. The new multi-role transport aircraft will replace the An24 and An12s. The MTAs are in the 15 tonne to 20 tonne category and have a range of 2,500 km and can fly at 800 km per hour, according to the Hindu. The Indo-Russian joint venture is believed to have been given a specific time-frame for freezing specifications like engine and also the systems and the basic layout apart from vendors, the paper added. Priority will be given for carrying out the work in the specified time frame and also to get the right technology and work within the cost, according to the report.